We could spend our last five days in Tokyo, a city that we had visited many times before where our favourite haunts beckoned us: the observation level of the Metropolitan Building to see Mt. Fuji, shopping for books at Kinokunya in Shinjuku, or at Disc Union for used CD’s, or for clothes at Muji and Uniqlo and then over to Tokyu Hands department store to shop for just about anything you can image. But this was too easy as it pandered to our comfort level. I’ve surmised that too many travellers fall into this deceptively happy routine and therefore rarely consider that all-important ‘what else’ when they think of travelling again. So we made plans to spend most of our time in a brand new setting and chose Niigata Prefecture. Niigata City is 90 minutes northwest of Tokyo by bullet train. The surrounding area is known for its susceptibility to earthquakes, the variety of onsen (hot springs) and ninety-one sake breweries, but it was the last two features that were high on our list of priorities. We checked out of the Niwa Hotel in Tokyo, a beautiful, small four-star property that oozes culture and offers soothing Japanese decor, a garden entrance as well as a garden on which to gaze during meals (Niwa means garden), friendly staff, free internet and a tasty breakfast buffet. At Tokyo Station we took the 9:12 am train to Niigata, arriving at 10:40 am and then, after dropping off our luggage at our hotel around the corner, we caught the 11:40 am train to Shibata to start exploring. While our unplanned reception on arrival was cold and heavy rain, we shrugged it off, took out our ‘to do’ list, opened our umbrellas and ventured forth. The first stop was all of 2 minutes away from the train station; lunch at Nagashima restaurant. We sampled the sake to test out the spirit of the place. You see, in traditional restaurants, the server brings the 1.8 litre bottle of sake to the table along with two glass glasses and two saucers (or very shallow bowls). She then sets each glass in the saucer, and pours out the sake so that it overflows the glass and fills the saucer. You then bend forward to sip the sake (lest you needlessly and wastefully spill even one drop); after which you pour the excess sake from the saucer into the glass. This was all done to perfection and the sake itself was very clear and dry with only a tiny aftertaste that whispered ‘smooooth’ to my taste buds. We were off to a good start! For lunch I ordered the chirashi which consisted of sashimi (raw fish and seafood) on a deep bowl of rice. My friend ordered Katsu-don, which is deep-fried pork on a bed of rice. Both dishes were very fresh, well prepared and taste-provoking (you’ve heard of thought provoking? Well, when your taste buds need time to recuperate from an incredibly good experience, we call that ‘taste-provoking’). The rain was still happily pouring down at the time we finished lunch so we bundled up against the cold, popped our umbrellas open and headed out toward the Ichishima Shuzo, the local sake brewery, about 15 minutes away. They say that necessity is the mother of invention. Learning to steady my camera with both hands while I took photos of the brilliantly coloured leaves on a Japanese Maple Tree (this was November, after all), AND holding an umbrella under my arm, provided us with our afternoon Cirque de Soleil manoeuvre, but it worked, and the raindrops stayed off my camera lens. The Ichishima brewery was not in production, as most sake is made at the beginning of each year. But the display areas showcased the barrels, wagons and other wooden implements from days gone by (the brewery was founded in 1790) and the gift store was open and it goes without saying that no good sake brewery gift store is worth its weight unless it provides free samples of the product. This was the, uh, educational part of the visit. And we craved knowledge. Outside, we grabbed a taxi to take us across town to Shibata Castle, with its crooked, cracked stone walls that have withstood earthquakes and sieges since the Castle’s completion in 1654. Not all the castle buildings were open but they were bound together by the castle moat and the bright red and yellow leaves of the trees that stood as both sentinels and neighbours. In the turret by the entrance, you can visit the second floor museum, accessible by a very steep, narrow and shallow staircase, with a rope to help you ascend and descend. The purpose of this was to allow only one person at a time to gain access to the higher castle floors, from a defensive point of view. We wandered the grounds, took some photographs and then caught the local bus to our next stop; the town of Tuskioka Onsen, about 30 minutes away. When we arrived around 4:45 pm but it was already dark outside. We were directed to the tourist information office, really a convenience store, where we paid 500 yen apiece (about $7.50 US) and in return we each received one sake cup and a booklet with 5 tasting coupons. The sake cup was white with a blue ring on the inside bottom. We were told that this helps to gage the clarity of the sake by looking at the filled cup and seeing how clear the blue ring is. So, properly armed, we took a map of the small town and we were off. The sake sampling covers 30 different venues in the town, some in hotels and some in restaurants. Each site offers between 2 and 4 sakes and with your coupon book, you choose to sample one of the sakes, and then move on to the next venue. It’s actually a fun way to explore the town but also, as you have to enter each building to taste the sake, you get to check out each place. What a great marketing promotion! And as a matter of fact, there was one old hotel, the Senkei, that really impressed us, and we made a mental note to consider staying there the next time we’re in the area. We spent about an hour wandering and sampling as well as recording our own sampling notes along the way (for future reference and purchases). By 6:00 pm we had used up our coupons so it was time to indulge in one of the onsens. We went to the small public bath house to ease our bodies out of the cold and the rain and into the 52 degree C waters, and just relax. While the heat was soothing...for a while, we had to get out after about 15 minutes, so we got dressed and journeyed back to Niigata City for the evening. Day Two was just as adventurous as our first day. We left the hotel quite early and took a train to the station by the Central Market, where we understood it was about a 15 minute walk to the market itself. It turned out to be a full one-hour walk, but the rain held off so it was not that taxing and we were soon to discover, really worth the effort. Our reward was a market building filled with fresh fish, seafood and vegetables; a perfect setting to wander, take in the fresh smells of the produce, enjoy the friendly banter of the vendors, and photograph the colour and chaos of a busy Saturday morning market. The added-value feature was that there were a few small restaurants on site and we were well overdue for breakfast after our long walk. One of the vendors recommended Chuo-shokudo (literally, ‘central restaurant’) where we had fresh seafood with rice and tea. The word ‘delicious’ (oishi, in Japanese) doesn’t begin to do justice. After another look around the market, we asked a cashier at one of the shops about getting back to the train station, and a friendly customer in the next aisle joined the conversation and offered us a ride in his van. This time we took the train to Suibara, where we boarded a local bus to visit one of the onsen for which the small town of Murasugi is famous. The bus driver was very friendly and carried on an animated discussion with my Japanese friend, and just before our stop, he asked one of the passengers to show us the way to the onsen. We walked along a path through the woods, accompanied by the most spectacular display of changing leaves you can imagine. Each tree festooned in bright colours, was trying to outdo its neighbour and as a reward, each tree became a model for my photographs. Exiting the woods, we wandered the narrow, crooked streets of the village where two onsen were located, almost side by side. One was outdoor, one was indoor. Now all morning it had been threatening rain, and now a snowy, hail was falling. The temperature was below freezing and so in the spirit of being adventurous, we decided to tackle the outdoor onsen first. And I mean that everything was outdoors including the change room and lockers. We bought two admission tickets from the vending machine, only to find a sign on a small mail box nearby suggesting that no one was on duty at this onsen so “please deposit your paid ticket in this box”. Trust the honour system! We put our clothes in the lockers and then stark naked, walked, very briskly I might add, on the slippery stones to the onsen’s 42 degree Celsius waters. And just in time for now it started to hail quite aggressively. We covered our heads with our towels but we were already wet, so no need to get out of the warm waters. Sliding down in the water so that we were neck-deep, we enjoyed the peace and tranquility of the rock and tree setting, as well as the hail, then the snow, then some rain, and then more snow. A short time later we changed into our winter clothes, walked around the corner to the indoor onsen, and repeated the procedure: clothes in the locker, shower, sit in the onsen for 15-20 minutes, get out, shower, change back into winter clothes and walk back through the picture-book colours of the trees in the woods to the bus stop. The same bus driver picked us up so now we were old friends. He gave us a bit of a tour of the area as he followed his designated route, which included a temple and access to the “Five Heads Mountain” which is one of the area attractions. We vowed we would explore the mountain on our next visit but now we had to wing our way to Swan Lake! About 30 minutes later, we said our good-byes at Lake Hyoko. It's nicknamed Swan Lake for the thousands of ducks (and about three dozen swans) that fly from Siberia each year to converge on the waters to feed, be fed, and otherwise socialize and network with each other in their own version of an Aviary Facebook. We bought duck food (which resembled white Rice Krispies) and joined the crowd who like us, had braved the pouring rain and cold to be with the ducks and swans. But the attraction of the area went further, with twisted, mysterious trees around the lake, backed by the dark waters and misty mountains in the distance, accompanied by the cacophony--the natural soundtrack – of the local residents, which included ducks, swans and people. After warming up with a nice hot coffee at the nearby store, we were off again on a local bus to our final stop of the day in nearby Agano, with a visit to the Ichigozakura Shuzo -sake brewery. Again, this brewery was not in production at this time of year but they offered a tour, so we put sanitary nets on our heads, and took the short tour in Japanese (with Mitsuru, my translator on hand) before the mandatory tasting, purchasing and photos with the brewery staff. It was a very friendly time. Back in Niigata City, we had reserved dinner at Goro, one of the best seafood restaurants in the city, and it did not disappoint. The sake was delicate and smooth, the pickles, fish and seafood dishes were fresh and expertly prepared in the open kitchen, around which we sat on bar stools, and the service was wonderful. Another exceptional day in the Prefecture. We had a train reservation back to Tokyo on the afternoon of Day Three, which allowed us time for a bit more exploration, this time in Niigata City. We walked to downtown Niigata to see the Art Park, and spend some time in Bandaijima Pia, the vegetable, seafood and liquor market buildings. We bought crackers to bring home as well as some souvenir sweets for friends, but the lure of the sushi restaurants was too strong to resist. We chose Benkei, which serves kaiten sushi: freshly prepared sushi that travels around the counter area on a conveyor belt. You choose whatever dishes you want and then at the end of the meal, the server adds up the different coloured plates; each colour representing the price of that dish. The sushi, sashimi and miso soup were fresh and delicious. Another taste-provoking moment but also a great way to end our short stay in Niigata prefecture. 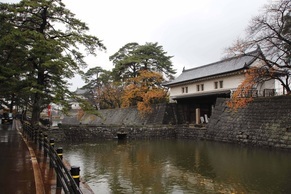 So now we are back in Toronto and already thinking of the next trip to Japan in 2013, my 12th trip to the country. Of course we will see and explore new places but somehow I am pretty sure we will justify another trip to Niigata. It was so interesting, refreshing and rewarding to just wander and discover, and of course there are still more things for us to see and do. While nowhere but in Niigata can you experience what we did on this trip, each area of Japan has its own hidden rewards. There is no such thing as “seen one town...seen them all”. Over the years we have fallen head-over-heels with different towns and cities in Japan for their own unique personalities. And the magic formula of travel is that when your personality and your needs mesh with the personality and features of a ‘place’, it’s inevitably the beginning of a beautiful relationship of memories, photographs and daydreams. Niigata prefecture, for me, is one such place.